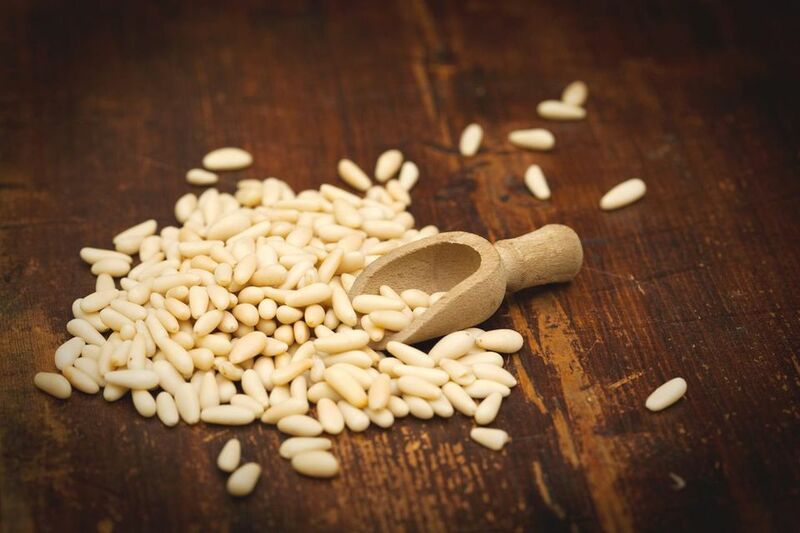 Pine nuts are small tear-dropped shaped tannish-colored seeds that measure about 1/2 inch long. When eaten raw, the seeds have a soft bite and most have a sweet, buttery flavor. As their name implies, pine nuts to come from pine trees. There are about 20 species of pine trees that produce seeds large enough to be worth harvesting to sell. In other pine trees, the seeds are also edible but are too small to be significant enough to harvest and sell for consumption. Pine nuts are very commonly eaten throughout Europe, Asia and now the United States. They can be found whole in meat, fish, salads or baked goods. Additionally, crushed or powdered pine nuts are added to pesto and other dishes. They are well known in Pignoli cookies, an Italian-American sweet treat made from almond flour dough and topped with toasted pine nuts. When cooking for guests, be sure to let them know when you are including pine nuts in the recipe. Most people who are allergic to more common nuts are also allergic to pine nuts. Pine nuts may be eaten raw but are usually roasted or toasted. As with most nuts, toasting brings out more flavor. Heating nuts will intensify the flavor of the nut by warming the naturally occurring nut oils. You can toast the nuts in the skillet, oven, or even microwave. Roast raw pine nuts on a flat tray in a 350 F oven for about 10 minutes, shaking halfway through. They may also be toasted on top of the stove in a heavy skillet, stirring often until they turn golden. Keep a close eye on the pine nuts as they can very quickly move from roasted to burned. Many markets sell ground pine nuts for use in confections and baked goods. If you cannot find ground pine nuts in your local market or specialty store, they are easy to make. Simply add the measured amount of pine nuts to a food processor or spice grinder and process to your desired consistency. Pine nuts are an excellent source of protein, more than any other common nut. European varieties tend to have more protein than American varieties. Chinese varieties of pine nuts have a much stronger pine flavor than the milder Mediterranean and Italian varieties. Blanched, slivered almonds can be substituted for pine nuts in many recipes, but not for classic pesto.